John Stillwell PA Archive/PA Images. All rights reserved.You can watch the Jewish American academic Norman Finkelstein on YouTube taking a question from the audience after one of his lectures in 2013. The questioner asks why the Arab world failed to establish a Palestinian State when they had the opportunity to do so after the UN mandate to partition Palestine in 1947. Finkelstein’s lengthly and eloquent response makes four salient points. First, realising immediately that the question had been prepared beforehand since it had nothing to do with the topic under discussion, and was consequently not asked in a spirit of genuine inquiry, Finkelstein urges the questioner to open his mind and listen and think for himself since he was not listening to an enemy. Second, the question was completely irrelevant because of the progress that has been made since 1967 when the Arab countries came to accept the two-state settlement which is the basis of what we have today. Third, in returning to a time before 1967 the question was clearly motivated by an agenda which needed to avoid mention of this progress towards a negotiated settlement in order to maintain the status quo. Fourth, the Arab nations could not accept the legitimacy of the State of Israel in 1947 because, reasonably, they could not accept a movement (Zionism) which, according to Finkelstein, citing leading Israeli historian Benny Morris, had territorial dispossession and dislocation built into it. As with Finkelstein’s questioner, Dave Rich’s new book, The Left’s Jewish Problem. Jeremy Corbyn, Israel and Anti-Semitism, also has an agenda. Rich attempts to argue that the British Labour Party has a systemic problem with anti-Semitism under Corbyn’s leadership as the title implies. But since there is little or no evidence to support this view, the real purpose of the book is to suggest that since Israel’s critics are motivated by anti-Semitism their criticisms of Israel’s policies and actions are simply a pretext for the expression of their anti-Semitism which then renders all such criticism invalid. The all-too-evident and depressingly familiar tactic here – weaponising anti-Semitism in order to distract attention away from Israel’s serial violations of international law by turning the tables on those who criticise it (effectively, shooting the messenger) – has a predictable effect on Rich’s thinking since the book is an object lesson in evasiveness, making false claims, distorting the facts or ignoring them entirely. The results of a remarkable piece of investigative journalism using undercover reporting and secret filming was recently broadcast by Al Jazeera to uncover the extent of the influence of the Israel lobby on British political life. The investigation created a scandal when a senior political officer at the Israeli embassy, Shai Masot, was filmed discussing with Conservative ministerial aid Maria Strizzolo, ‘taking down’ prominent British politicians like Deputy Foreign Minister Alan Duncan. Even Conservative MP’s were outraged by this attempt by a foreign power to interfere with and even subvert the political process by clandestine means. The government’s response was feeble. Israel’s apology, Masot’s recall and Strizzolo’s resignation was sufficient for Theresa May to regard the matter as closed. As the investigation made clear the scandal was connected to the Labour Party’s anti-Semitism crisis which had begun earlier in February 2016 with allegations of anti-Semitism in the Oxford University Labour Club based on little more than the organisation of Israel Apartheid Week. Club co-chair and former intern with the prominent lobby organisation British Israel Communications and Research Centre (BICOM), Alex Chalmers, resigned in protest. The affair was investigated by then Labour Students National Chair Michael Rubin who figures significantly in the Al Jazeera investigation as a Parliamentary Officer for Labour Friends of Israel (LFI). Rubin is seen on camera admitting that the LFI works closely with the Israeli embassy while maintaining the appearance of independence. The Chair of LFI MP Joan Ryan was said to be in almost daily contact with Shai Masot. In a conversation between Ryan and Masot recorded at the Labour Party Conference in Liverpool in September Masot makes clear that £1 million is available from the embassy to support the activities of LFI including taking MP’s to Israel. Masot was also working hard to establish a young LFI group with Al Jazeera’s undercover reporter ‘Robin’. He admits on camera that money would be available from the embassy to help set up this group. We can only conclude that a range of supposedly independent political organisations in the UK are receiving help and financial support from the Israeli embassy in exchange for promoting a favourable view of Israel. We can only conclude, because the evidence is overwhelming, that a range of supposedly independent political organisations in the UK including LFI, the Jewish Labour Movement, and the Young Fabians are receiving help and financial support from the Israeli embassy in exchange for promoting a favourable view of Israel as well as combatting those who criticise it. Israel’s most effective weapon in the campaign against Palestinian activism and the BDS movement is to equate them with anti-Semitism. Israel was bound to turn its attention to the Labour Party when it elected long-time supporter of the Palestinian cause Jeremy Corbyn as leader. 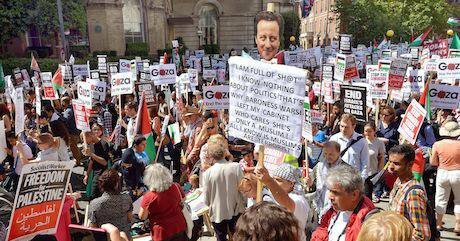 Undercover filming at the Conference of the smearing and wilful misrepresentation of critics of Israel with the bar of anti-Semitism set so low as to be virtually impossible to avoid reflected the wider circulation of unsubstantiated allegations of anti-Semitism in the Party both to undermine Corbyn and stifle criticism of Israel. Through the summer and into the autumn the search for anti-Semites in the Labour Party continued in a manner that can only be described as a McCarthyite witch-hunt with lurid headlines and dramatic ‘exposés’ in an overwhelmingly pro-Israel press and on television. But as the Al Jazeera investigation helps make clear, the Israeli embassy had a hand in the whole affair and were working strenuously behind the scenes through their front organisations and with the help of right-wing Labour MP’s keen to topple Corbyn to make the label stick in spite of there being little or no evidence to support it. These manoeuvrings exemplify the kind of self-interested or instrumental thinking that the German Jewish philosopher Max Horkheimer thought had come to dominate liberal democracies at the expense of its more public and objective counterpart after the war. For Horkheimer, because it pursues only the interests of the part and not the whole, instrumental reason loses contact with the world where the truth lies and so remains rational only in its own terms while becoming increasingly irrational in relation to the whole. Deprived of its rational foundation in the world instrumental reason becomes imprisoned by the interests of those who bind it to their immediate aims and objectives. It offers no check to those who might wish to exploit other human beings as no more than a means to achieve whatever end they deem fit. The situation is much worse today than it was just after the war since post-truth politics which seems to be everywhere gaining ground is instrumental thinking taken to an extreme. Because self-interest has swallowed up the world and deprived it of any independent existence there can be no appeal to some outside other that might arbitrate against it and hold it to account. For the government of Israel, whose skilled use of instrumental reason is second to none, that outside other is Palestine and the Palestinians who make up the whole – Israel/Palestine - which can never be discussed except as a security risk. Israel/Palestine can never be discussed because it is true in two fundamental senses. First because of the shameful truth of the effects of occupation in the West Bank and siege in Gaza both ruled illegal under international law. Second because of the truth of Israel’s unstated ambition, based on the belief according to Minister of Strategic Affairs Gilad Erdan, who was secretly recorded in London in 2016, that, ‘The land of Israel totally belongs to the Jewish people. Not any compromise morally, biblically…The land of Israel belongs to the Jewish people’. A mind-set which allows you to see only half the world because the truth of the other half is either unbearable or impossible to admit becomes binary in all its aspects. Whether things are right or wrong comes to depend on the speaking subject rather than independent evidence. Hence those who speak against Israel cannot be other than anti-Semitic. Even Jews cannot escape being drawn into this binary logic. Norman Finkelstein’s response to being described as a self-hating Jew is again instructive. Suppose, he argues, if, instead of being a self-hating Jew he became a self-loving Jew, how would this change materially affect the facts on the ground? He, of course, rightly concludes that it would have no effect whatsoever. It is precisely the denial of the facts on the ground that allows the notion of the self-hating Jew to function. The Israeli government and its supporters need to break out of the prison house of their own thinking by taking a broader and more inclusive view of things. Above all they need to listen to and reflect on rather than dismiss what others have to say since, as Finkelstein says, they are not listening to an enemy.